Bacteria do not develop transmissible spongiform encephalopathies, but they have been found to produce prions – proteins that can adopt alternative conformations with different functions. Prion diseases, a frequent topic on this blog, are caused by misfolding of a normal cellular prion protein (illustrated; image copyright ASM Press). 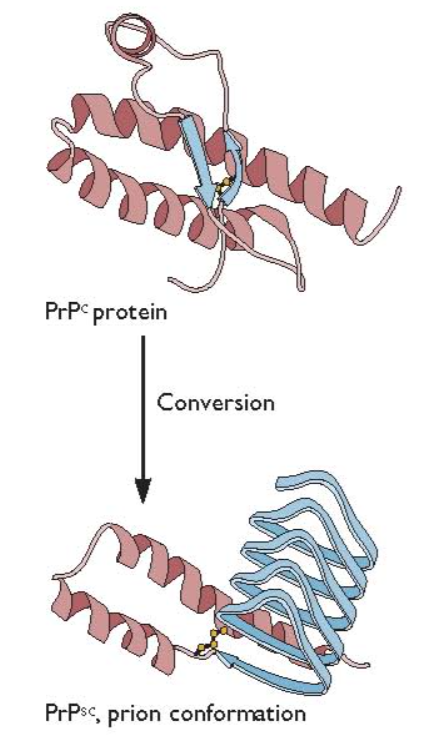 Prion proteins are found in other organisms, where the alternative conformation confers a new, non-pathogenic function to the protein. At least 12 different prion proteins have been found in yeast, and they confer the ability to grow more efficiently under certain conditions. Now prions have been discovered in bacteria (link to article). A search of 60,000 bacterial genomes for proteins with prion-forming domains revealed one in the transcription termination protein Rho from Clostridium botulinum (Cb-Rho). When produced in E. coli, the protein forms amyloid – protein aggregates in the form of fibrils – that are characteristic of prions. A 68 amino acid stretch of Cb-Rho can functionally substitute for the prion-forming domain of a yeast prion-forming protein. This protein, called Sup35, can read stop codons in the prion state, and this phenotype was recapitulated in yeast by the Clostridium prion. 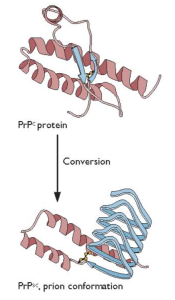 The Cb-Rho prion can convert between prion and non-prion conformations in E. coli. This property was demonstrated by placing a Rho-dependent terminator between a promoter and the lacZ gene, the product of which produces a blue color. In the prion state, Rho has decreased activity, leading to blue cells. In the non-prion state, normal termination leads to pale blue colonies. A mixture of blue and pale blue colonies was observed, showing that Rho exists in the prion and non-prion states. The prion conformation was also shown to be heritable. Blue colonies always gave rise to blue colonies, while pale blue colonies formed pale blue colonies. The blue colony color lasted for over 120 generations. The finding of a prion in bacteria indicates that this form of protein-based heredity arose before eukaryotes emerged on Earth. Similar prion-like protein domains have also been found in other phyla of bacteria, suggesting the existence of an important source of epigenetic diversity that can allow bacterial growth under diverse conditions. Exactly how bacterial prions confer new functions will be exciting to discover. Last time we learned that eukaryotes probably didn’t invent the nucleus. Now we find that prions likely emerged first in bacteria. Did eukaryotes invent anything?